Pallet rack consists of a series of upright beams (typically referred to as "uprights") and cross beams ("beams") which form a shelving system that pallets can rest on. 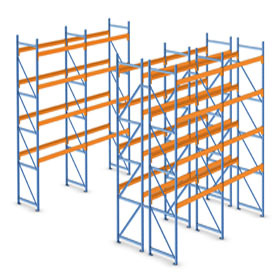 These racking systems serves as an affordable and reliable industrial shelving system, increasing the storage capacity of a warehouse or production facility. From traditional pallet rack to cantilever, we stock a large amount of new and used pallet racks with a variety of different sizes and storage capacities. . We find that offering both new and used system allows the customer to find the exact product they need. The major benefit of used pallet racking is that it provides the same storage capabilities as new racking at a fraction of the price. However, if your facility requires new pallet racking systems, we have an expert team capable of providing you with the right product at competitive prices. Our pallet rack is the perfect way to increase the organization and space available in your warehouse. We pride ourselves on being the complete pallet rack supplier in central Florida and provide not only the racking, but all the necessary accessories for your racking system. From wire decks to safety clips, and from forklifts to pallet jacks, we offer everything your business needs for a safe and organized facility. We specialize in the Orlando area but regularly sell, deliver and install pallet-rack throughout the state and country. Call us today at (407) 859-8750 for our inventory and prices. In order to maintain our large inventory of pallet racking we will generally buy all used pallet racking at a competitive price. Contact us at (407) 859-8750 for a quote!